I didn't send you all any writing for the post yesterday because it was the day before Brian Hansen's race and I was trying to get to bed a bit earlier than 4:00am, which seems to be the time I get to bed these days...and today is ending up being no different. It's already 3 am! Brian and I stayed at the rink after his 1000m race long after everyone had left and we talked about sport. The journey and the goal. What is more important? Achievement of the goal can often cloud out a difficult journey. But if the goal is not achieved, has the journey been worth it? Brian, Jeffrey and Nancy have all been about the journey, but as the Olympics loomed more near, the goal became more the priority. Should that be? Maybe the focus on the journey and loving more of the moments could ultimately produce the end goal more effectively than the focus on the end goal...and what is life if you don't enjoy that with which you've been blessed? But the corollary is also, if you haven't achieved what you set out for, can you enjoy that either? Hey, thanks everyone for all your comments back to me [Nancy Jr. keeps sending me pictures of the comments so I can read them]. It has really meant so much that you write something. Like I've said, because I don't Facebook or Twitter [and whatever else there is haha], getting "pictures" of the Facebook pages is still novel to me! On our way to the 1000m Sochi Olympic race. 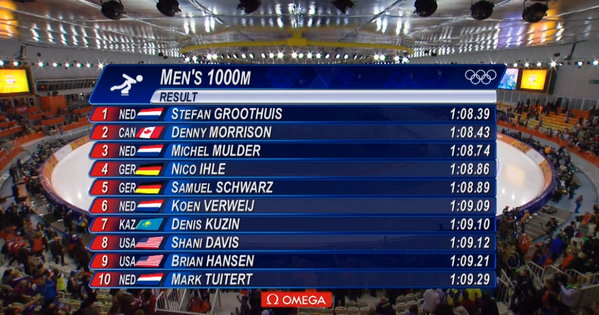 Brian's 1000m day!!!!!!! Of course I'm anxious!!!! An incredible day outside. Here is a shot of the Black Sea just 20 steps from our hotel out the front door! And then if you turn right around from where is was standing for the Sea front video just before this, here is the hotel I'm staying at. It's half a mile from edges of venues but a 20min. ride by bus.